We will work with you to ensure your fencing idea is brought to life and we complete it to our exacting standards. 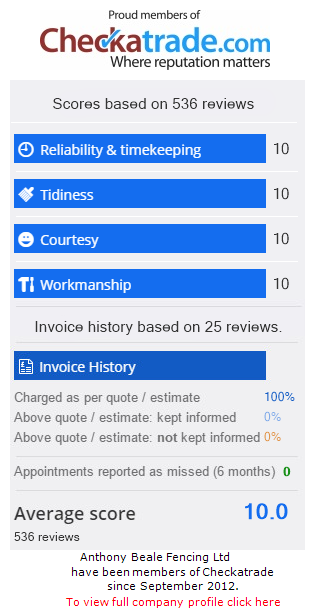 We take real, honest pride in our fencing which shows from the feedback that we regularly receive from our valued customers in Surrey; these can be seen on our testimonial page. We will only be happy when you are. We want our Surrey customers to feel safe in our hands, which is why Anthony Beale Fencing is Checkatrade vetted along with having a comprehensive public liability insurance and full guarantee for peace of mind. Over the years we have accrued expert fencing knowledge which we will use to advise you about your fencing project. As well as fencing in Surrey, we offer garden landscaping services including, patios, driveways and decking; our range of services allows us to see your fencing project through to the end; whatever you might need! Want to see some of our previous fencing projects in Surrey? These are just a small number of fencing projects we have completed in Surrey but we are sure that you will like them!